Jason Kelce's heiny is the only one Carson Wentz has known in the NFL. The 2016 Philadelphia Eagles season is essentially over, so with two games remaining, we'll continue to look ahead to the offseason. As a starting point, let's take a look at each position and figure out which players will be back in 2017. Today we'll look at the centers. On the downside, Kelce has committed a somewhat alarming number of penalties, he has had more than his share of bad shotgun snaps, and will often struggle against bigger DTs. Additionally, if the Eagles were to cut or trade Kelce next offseason, they would save $3,800,000 of his $6,200,000 cap number in 2017. Kelce has not played like one of the top ten centers in the NFL over the last two years. Those are all good reasons to move on from Kelce this offseason, however, there are also plenty of reasons to keep him as well. To begin, while he struggles at times, Kelce can do things that no other center in the league can do. For example, Kelce's game against the Seahawks a month ago was basically a long highlight reel of excellent center play. Building a starting five along the offensive line isn't easy. When you factor in that at some point you're likely going to lose a starter or two during the season, the number of offensive linemen you have who can play at the NFL level becomes extremely important. Kelce isn't without his faults, but cutting him would help deplete the Eagles' offensive line depth. On paper, that looks like a perfectly good starting five, however, you seriously compromise your depth by forcing either Allen Barbre or Seumalo -- both players who can play at least four positions -- into the starting lineup. Ideally, one of those guys could be your versatile "sixth man." At a savings of just under $4 million, moving on from Kelce just isn't worth it at this time for a player who does offer some attractive qualities, and gives you one additional player on your line. The tea leaves say that Kelce will be around at least one more year. When asked what Seumalo's best position is, offensive coordinator Frank Reich replied, "I think originally we drafted him to play guard in the short term." Depending on your definition of "short term," my guess is that Seumalo's potential move to center (his primary position in college at Oregon State) won't happen until 2018. In 2018, Kelce will count for $7,200,000 against the cap, $6,000,000 of which the Eagles would save if they traded or released him. While it makes sense to keep him around for one more year in 2017, it would probably take a Pro Bowl-worthy type of season to retain him at that number. 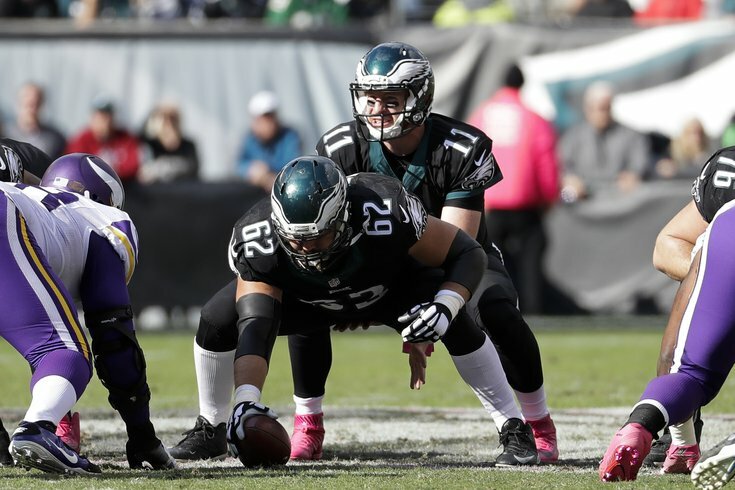 Jason Kelce: Stay or Go? Andrews is under contract through the 2017 season. In 2016, he has been inactive on game day for almost the entirety of the season. The Eagles like Andrews because he has guard/center versatility, and he'll count for just $615,000 against the cap in 2017. There's no reason not to bring Andrews to training camp, but the Eagles will ideally have found a player in the draft that they can begin to develop instead. #JimmyVerdict: No need to release before training camp, but ideally the Eagles will have found an upgrade. Josh Andrews: Stay or Go? And yes, for the record, I realize there's probably more green than you'd expect from a 5-9 team.